The primary purpose for our August bank holiday trip to Champagne was to conduct research (ahem) for our upcoming Prestige Cuvée vs Vintage tasting with Jancis Robinson MW. 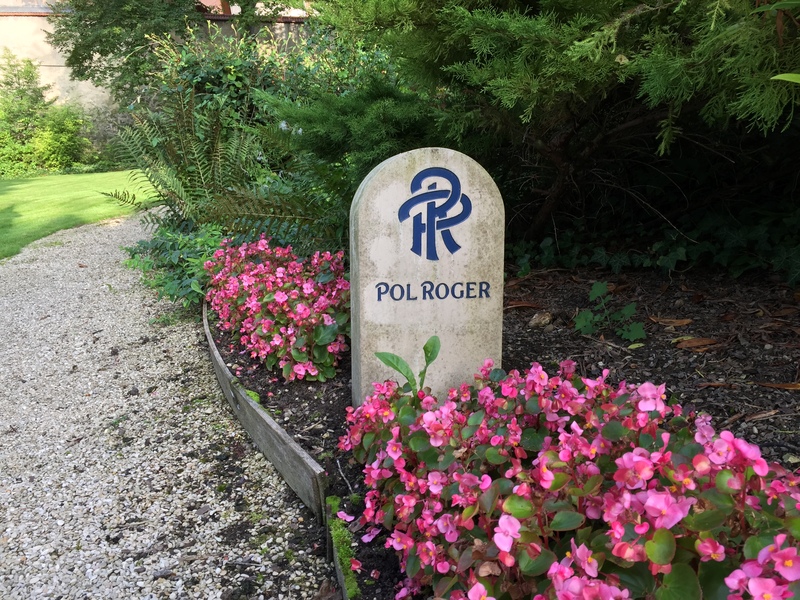 Although our visit to Pol Roger was the last of a very concentrated 48 hour itinerary, the exemplary efficiency of the tasting conducted was outclassed only by the stunning range of champagnes prepared. 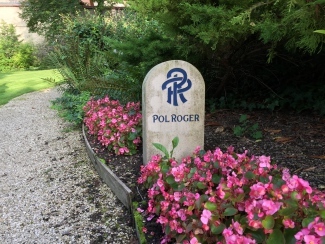 We met with President of Champagne Pol Roger Laurent d’Harcourt, who had kindly returned from holiday to re-open the House after their annual August break. Laurent’s knowledge is indubitable: with over twenty years experience in the Champagne region and more than a decade at Pol Roger, he’s a true fanatic with an infectious zeal for all things sparkling. The House has undergone incredible renovation in recent years – now with winemaking facilities that rival any of the top producers, it is the turn of the winemaking team to undergo modernisation and Laurent began with an overview of some of the changes ahead. 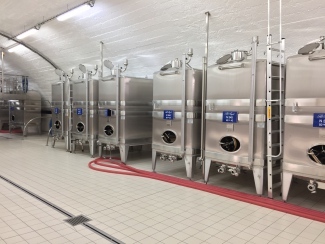 The most well-polished tanks in Champagne? 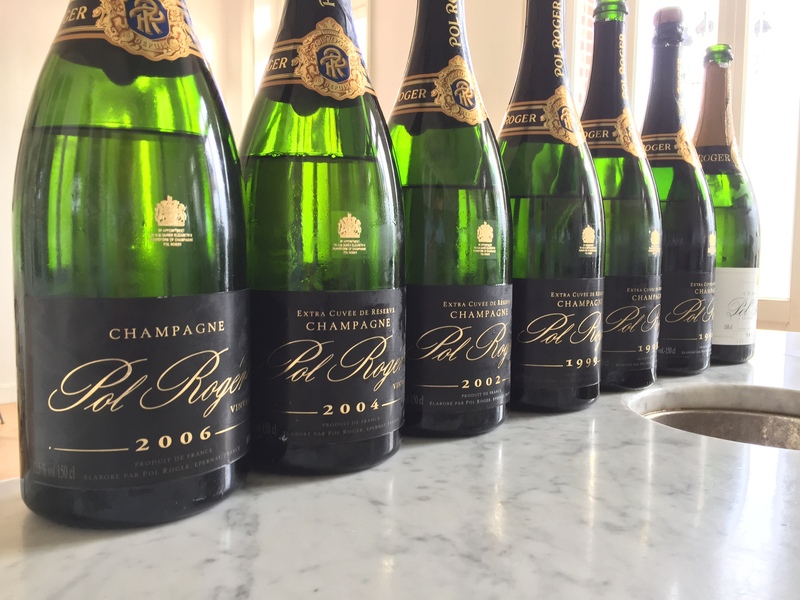 Most notably, current Chef de Cave and Champagne icon Dominique Petit – who joined Pol Roger in 1999 after over twenty years of winemaking at Krug – will retire next year. Rather than recruit elsewhere Pol will be promoting in-house, with current Director of Production Damien Cambres becoming Cellar Master upon Dominique’s retirement. Talking of this decision, Laurent explained that “blending is pretty easy” at Pol and is determined by a committee acting as a team rather than the Cellar Master alone. Damien, who joined in April 2017, will be charged with the task of maintaining Dominique’s consistency. 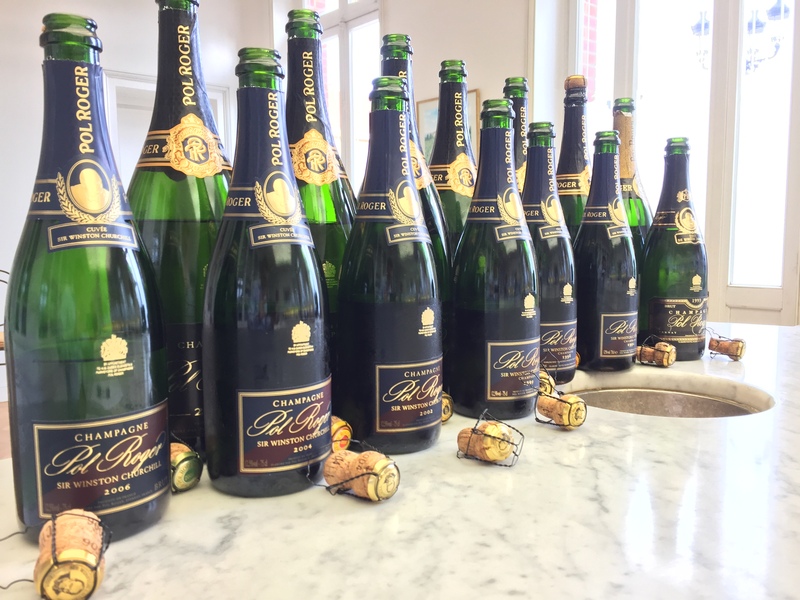 As the topic for our tasting was a comparison of vintage and prestige cuvée, discussion turned to the vintage category as a whole – a division which currently represents a tiny percentage of overall Champagne production and sales. Although acknowledging this fact, Laurent maintains that Pol Roger sell a lot of vintage champagne, particularly in the UK – something he attributes to the ‘Sir Winston Churchill effect.’ Whilst the great Prime Minister’s champagne obsession no doubt contributes to Pol’s strength in the UK market, their global vintage performance is also a sign of the low premium they demand over the non-vintage blends. That said, the volume of production and sale of prestige cuvée Sir Winton Churchill is of course much smaller. For our tasting, Laurent had prepared seven different vintages of Brut Vintage (to be served from magnum) and Sir Winston Churchill (to be served from bottle), the eldest, incredibly, dating back to 1993. Lovely golden colour. Nice fruit character, slightly lean on the mid-palate. Shows some mushroom character on the nose when you go back to it. More fruit-forward than 2006 and wow, much more mid-palate. Positively refreshing. Has nice fruit: apples and pears abundant. Buttery, creamy and pastry loveliness. Dosage seems high but this is in fact the richness of ripe fruit in abundance. Length is fantastic and mousse is all there. So much creaminess and power. Doesn’t seem to have much age, some great freshness and lemon and lime development. Has lots of that signature pastry character which brings the creaminess. A slightly mushroom nose and a bit closed to start. So much lime and complexity on the palate though and develops real creaminess given time. This is great and really opened up. Second magnum. Lovely clean nose with lots of lime and aged character. This is drinking well now. Has a lot of fruit salad character and wow acidity. Second magnum. Lovely golden colour. Again those signature creamy pastry flavours shine. Just seems to have a vibrancy and loveliness matched by incredible length. 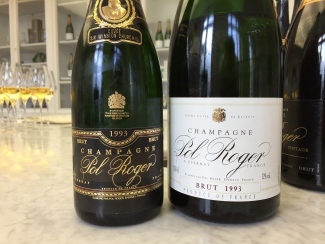 Interestingly, each magnum of vintage Pol Roger displayed a remarkably similar light-golden colour – indeed from sight alone it was almost impossible to determine between even the 2006 and the much, much older 1993. As we tasted, Laurent shared with us the House philosophy on dosage. Although they have spent the last decade reducing dosage, he commented: “We’re one of the Houses unwilling to go down below a certain level.” Currently hovering around 7-8 g/l for their vintage and 8-9 g/l for their Sir Winston Churchill, Blanc de Blancs and non-vintage blends, Laurent believes that dosage is often misunderstood by the consumer. “People confuse dosage, richness and complexity with ripe fruit character. Dosage helps a wine to age,” Laurent added. Has a slightly held back nose. Wow this is surprising, the fruit is really quite forward and the acidity is right up there. This is very elegant and well-balanced and the fruit seems lovely mid-palate. Great fruit-forward character, a signature of the generous 2004 vintage. Heaps of brioche, toast and some honeyed notes on the finish. Second bottle. Loads of development noticeable on both nose and palate. Great bubbles and loads of bread and caramelised character. Impressive length with a hint of smokiness on the finish. Slightly deeper colour. Has some very similar characteristics to the 1999 vintage. Slightly less fresh than the vintage. Has some signs of ageing, a real savoury character and impressive richness. Wow! This is a great bottle. Has lovely freshness, impressive lemon and lime flavour and fresh acidity. Very elegant. Another great bottle. Lovely creaminess, currently at that perfect stage of maturity. This is just so lovely and the fruit goes on and on. Second bottle. Good richness and loads of tropical fruit flavour. Bit quiet at first, but opened up well given time. So impressive once the acidity comes through and the finish lingers forever. 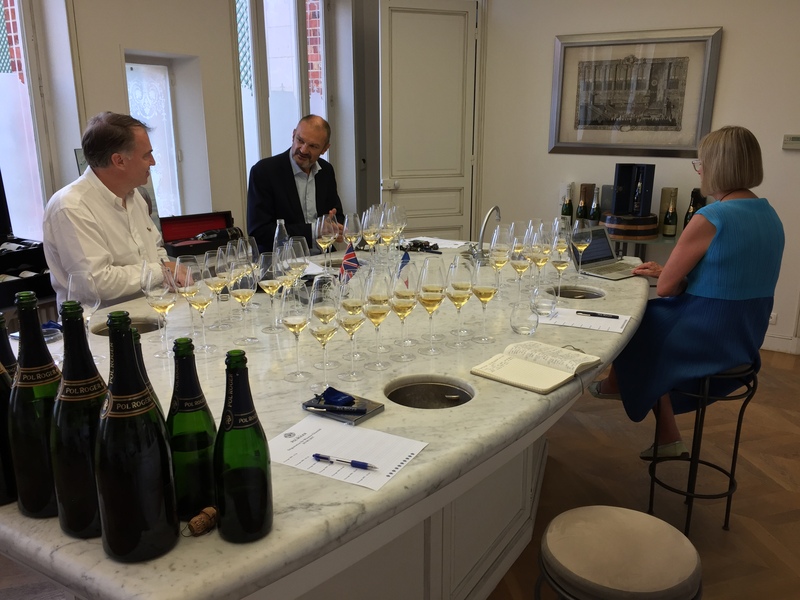 Whilst tasting the prestige cuvées, we discussed the House policy on disgorgement date information. When Laurent took over as President in 2005, one of the first changes he instigated was the sharing of disgorgment dates – printed however, on the cardboard cartons of six-packs rather than on bottles. “This is good information for the trade, but is misunderstood by the consumer,” he told us. A smart, well-thought-out compromise that is certainly more forthright than other producers, but we still favour full transparency. The first prestige cuvée tasted was of course the newly launched Sir Winston Churchill 2006. Available in the coming week, it was incredibly clean and pure and we found it to be much livelier and fresher than its brut vintage counterpart from the same year. Et voilà. Before we embarked on our late-night journey back to home shores, Laurent afforded us a quick tour of the winemaking facilities. 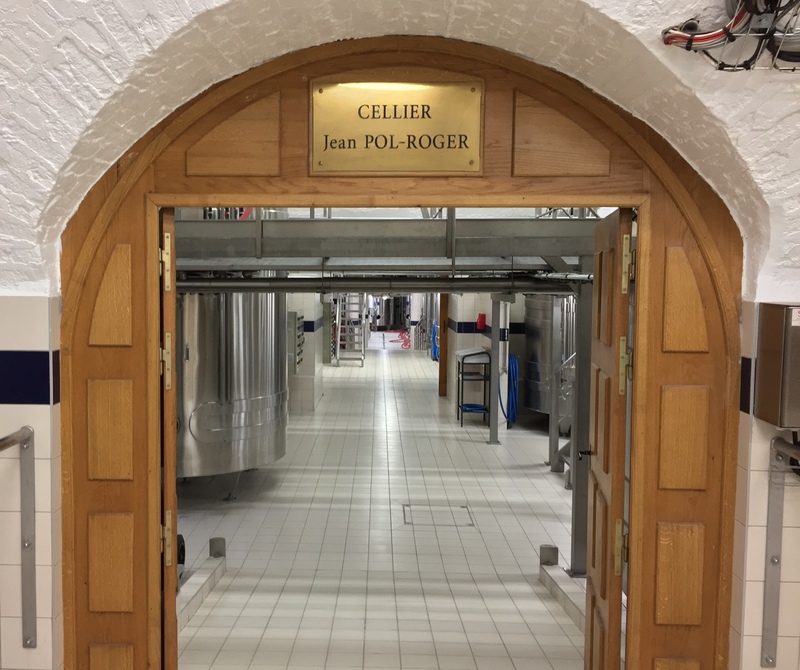 With a level of cleanliness normally reserved for operating theatres, the snow-white surfaces, shiny tiles and immaculately polished stainless-steel tanks of Pol Roger’s extensive cellars are a sight to behold. “We have a chance to become the first House to produce everything on one site,” Laurent concluded with obvious pride.